Volvo V60 Cross Country Performance, Engine, Ride, Handling | What Car? As we’ve already touched upon, there’s currently only one engine and one gearbox available: a 187bhp 2.0-litre diesel (badged D4) that’s mated to an eight-speed automatic gearbox and drives all four wheels. If you want a manual gearbox, front-wheel drive or a less powerful engine, forget it. 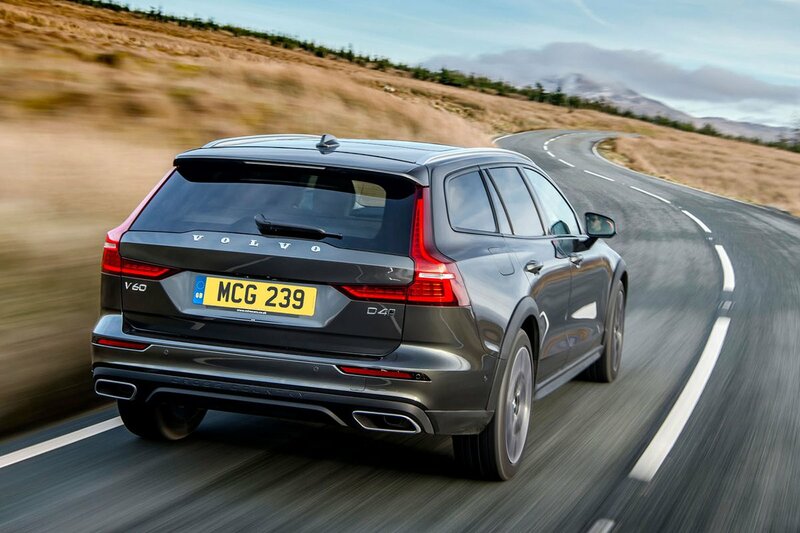 Fortunately, the D4 is our pick of the regular V60 range and once again proves a fine fit for the Cross Country. Although it doesn’t feel quite as potent as engines fitted to the C-Class estate and A4 Avant that have similar power outputs on paper, the D4 still displays plenty of low and mid-range urgency, making regular driving a breeze. Should you need to overtake, there’s ample power to get past slower traffic. Unfortunately, the Cross Country has an Achilles' heel: its automatic gearbox. As we’ve found in other Volvos, it tends to dither when you ask for a burst of acceleration. This is something you have to factor into your driving technique if you don’t want to get caught out when pulling out of junctions or going for a quick overtake. When it comes to four-cylinder diesel engines, nothing gets close to matching the Audi A4 for quietness, but the D4 comes a commendable second. It’s certainly more vocal than the A4, particularly when you accelerate hard, but never sounds harsh and is far less grumbly than the C-Class. With less noise from wind flutter over the doors, the A4 Avant also pips the Cross Country for hushed progress. However, road and suspension noise are kept to a minimum and the V60 is a pretty muted companion for big-mile jaunts. Such journeys are also made more comfortable by suspension that’s softer than that of a regular V60. Adaptive dampers aren’t an option, but that’s no real loss. 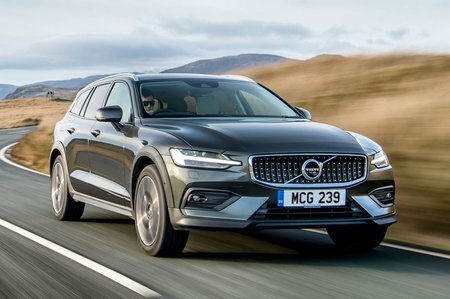 In fact, while the bigger optional 19in wheels usually hamper the V60’s ride, the Cross Country remains comfortable and irons out crests and compressions in a soothing manner. You do still feel surface imperfections as they cause the car to fidget a little, but it’s far less noticeable than in the regular V60. We’ve yet to try the standard 18in wheels but suspect they’ll bring a little more compliance over pockmarked surfaces. As well as being a little softer, the suspension also gives you an extra 60mm of ground clearance, but the Cross Country still handles well even with the additional height. Okay, it isn’t quite as sharp as a normal V60, but the steering is light in town and precise on country lanes and the car tracks reassuringly straight on motorways. 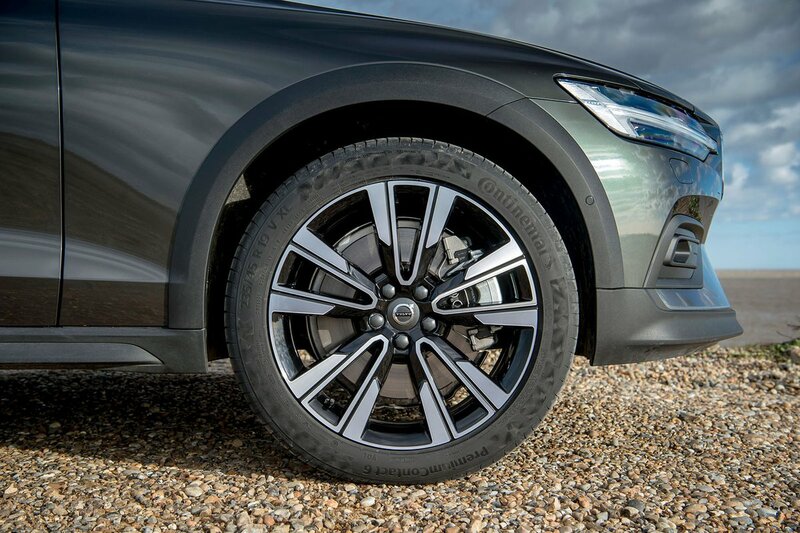 Meanwhile, the body resists leaning over too markedly and the tyres deliver plenty of grip when you want to press on. The Cross Country’s four-wheel drive system supplies excellent traction in dry conditions and combines with the raised ride height to offer an element of off-road ability. Should you find yourself in a muddy field, clever electronics are quick to bring the rear wheels into play to keep you moving, but you’ll not find quite as much traction as the more purposeful Subaru Outback can muster.